Lake Hillier is a lake on Middle Island, the largest of the islands and islets that make up the Recherche Archipelago, Western Australia. The most notable feature of the lake is its pink colour. The lake is thought to have been first visited by the Flinders expedition in January 1802. 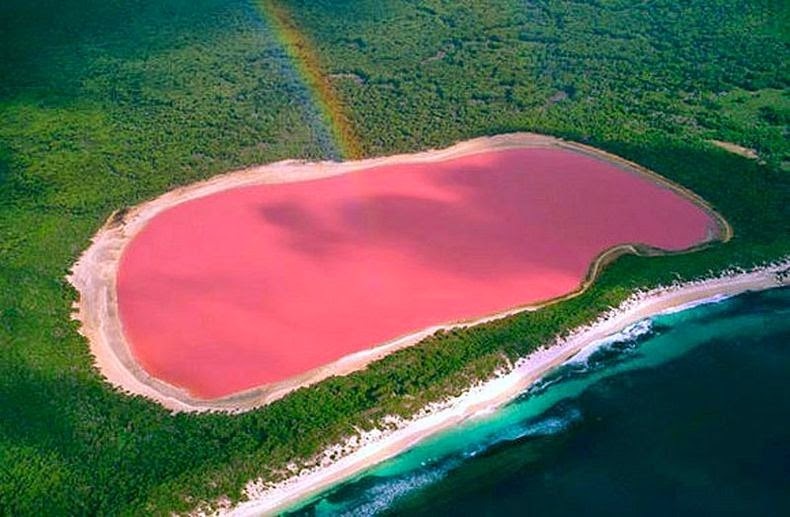 Flinders observed the pink lake after ascending the island's peak. John Thistle, the ship's master, collected some of the lake's water, which he found to be saturated with salt. The length of the lake is about 600 metres (2,000 ft). The lake is surrounded by a rim of sand and a dense woodland of paperbark and eucalyptus trees with a narrow strip of sand dunes covered by vegetation separating it to the north from the Southern Ocean. 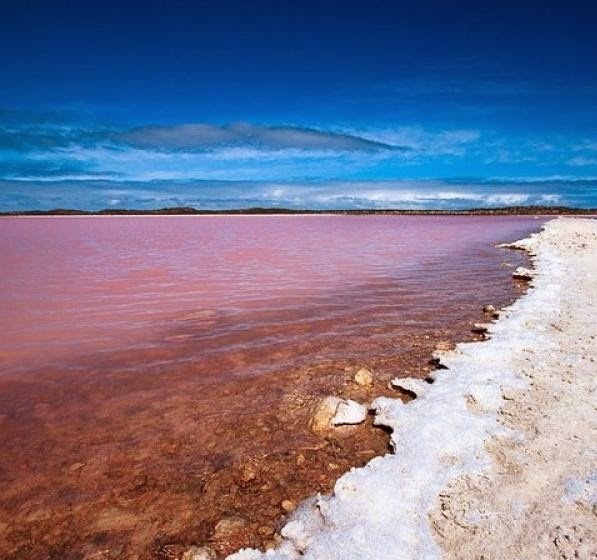 The most notable feature of the lake is its pink colour. It is such a significant distinguishing feature of the archipelago that air passengers often take note of it. The colour is permanent, and does not alter when the water is taken in a container. Although the source of the pink colour has not been definitively proven in the case of Lake Hillier, the pink colour of other salt lakes (e.g., Pink Lake) in the region arises from a dye created by the organisms Dunaliella salina and Halobacteria. Another hypothesis is that the pink colour is due to red halophilic bacteria in the salt crusts. Despite the unusual hue, the lake exhibits no known adverse effects upon humans. 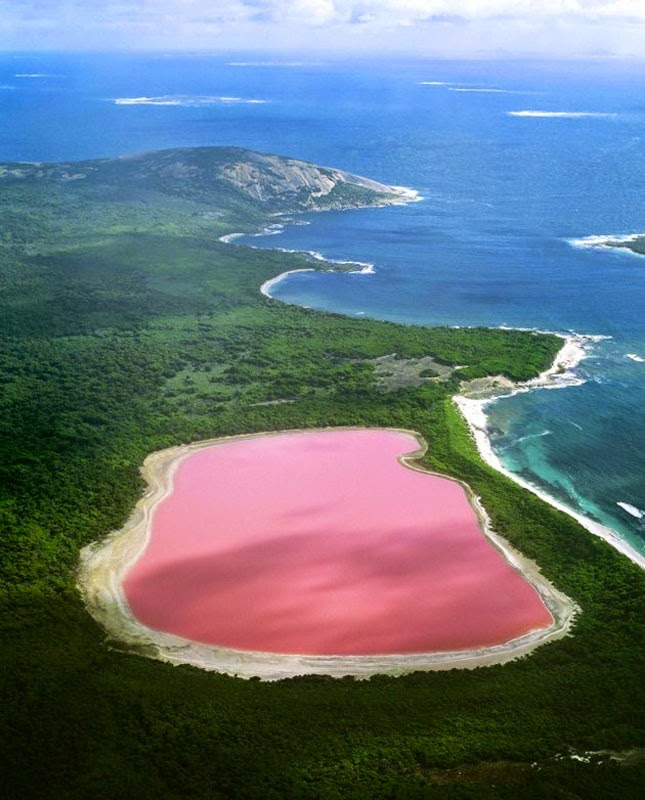 From above, the lake appears a solid bubble gum pink, but from the shoreline it appears more of a clear pink hue. The shoreline is also covered in salt crust deposits.